This very popular and reliable series is now available in updated editions. 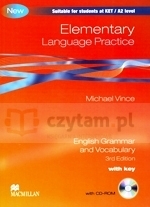 An in-depth, detailed approach to English grammar and vocabulary, this is a combination of two books - with grammar clearly presented in the fi rst half, and vocabulary input off ered in the second half. It is a thorough and comprehensive series that ensures students' confi dence with language through the progressive levels. Available with or without the answer key, these are ideal for classroom work or independent study.